One of our favorite things to do for our homeschool preschool is to craft a vehicle for each letter we work on. For the letter “H” we focused on helicopters. We chose to do a recycled craft when making our fun helicopter craft. 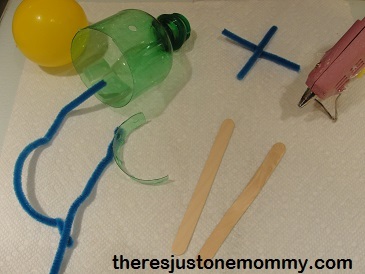 This helicopter craft was my son’s favorite activity for H is for Helicopter. We have done a different vehicle for each letter of the alphabet. You can find all of them on our vehicle crafts & activities page. Affiliate links have been provided below; see my full disclosure here. 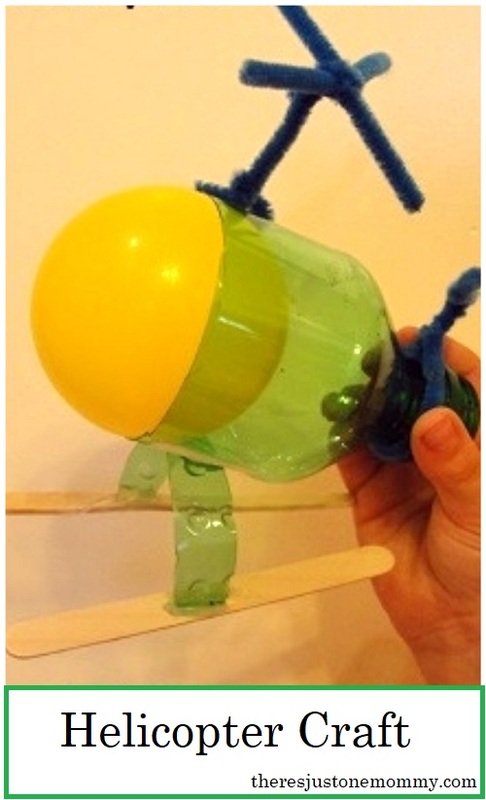 To create your helicopter, hit the recyclables box and find a small plastic drink bottle. This will forn the main body of the helicopter. Cut the bottle in half, saving the half with the mouth piece. Cut a 1/4 inch thick piece strip from the other half of the bottle. To begin your helicopter, use a hole punch to make a hole in the plastic bottle top, about 1 1/2 inches from the mouth piece. Tread a 3 inch piece of pipe cleaner through the hole, twisting it around the end you cut off. Twist to secure it. 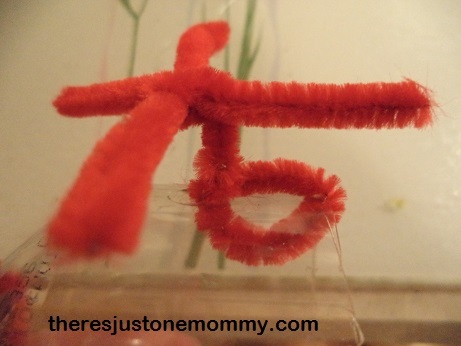 Use two other pieces of pipe cleaner to form a cross. Secure them to the piece of pipe cleaner that is threaded through the hole. This will form the main propeller on top. Use the hot glue gun to secure the 1/4″ wide strip of plastic bottle upside down to the bottom of the bottle half. Hot glue the craft sticks to the edges of the plastic strip to form runners for your helicopter. Twist 1/2 a pipe cleaner around the mouth piece of the bottle to form the rear propeller. 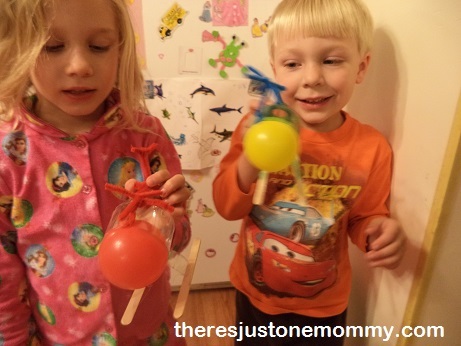 Stick the plastic ball into the bottle’s opening and your helicopter craft is finished! Oh, wow, this is an amazing craft. I can see why they had so much fun. My son told his daddy it was his new favorite helicopter — high praise from a 4 year old! I have to say the helicopters have been big hits this weekend — and we’ve used them for some fun learning, too! What a great craft! I’m sure he’ll remember the letter H after that! We might have those supplies around here too… ! How fun! Thank you for sharing at our Pinning for Play link party! Fabulous helicopter, love it! Would be great hanging over a child’s bed too! thanks for sharing on craft schooling Sunday! Oh that’s amazing! WHat a great idea. Thanks so much for featuring it! You come up with the most creative projects! I love that you used recyclables too! Thank you! This one has been one of our favorites!